Now is the time… !! One motive to stand up together for this noble cause! This run acknowledges the battle of HIV affected children by raising funds to aid their educational and medical needs. 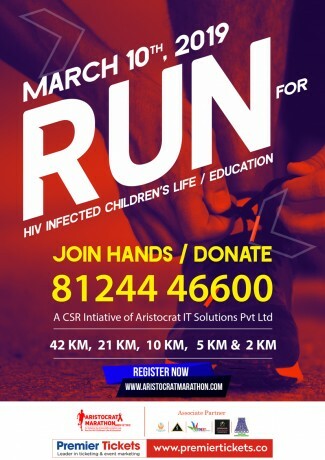 To aid the education and medical facility of HIV infected children. Premier Tickets is an online event marketing and ticketing agency. Premier Tickets will NOT be responsible for any changes related to the event schedule, artist, venue or cancellation and refunds related to the tickets for Aristocrat Marathon. Premier Tickets is proud to be the online ticketing partner for Aristocrat Marathon.